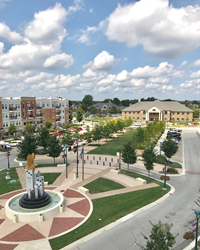 OurHealth today announces a new partnership with the City of Fishers that will provide its more than 450 employees with high-quality and convenient primary care, along with a series of wellness programs. OurHealth is a provider of onsite and near-site primary care clinics and wellness programming focused on enhancing the patient experience and lowering healthcare costs for businesses of all sizes. Its MyClinic network, an industry first, significantly lowers the barrier to entry by allowing employers of all sizes to gain immediate access to a network of primary care clinics around the city. OurHealth offers a comprehensive healthcare approach to its clients and their employees, which includes primary care services, wellness services, onsite laboratory and medication dispensing services, and referral guidance. OurHealth has clinics in Indiana, Illinois, North Carolina, Pennsylvania, and Tennessee. To learn more about OurHealth, visit http://www.ourhealth.org.